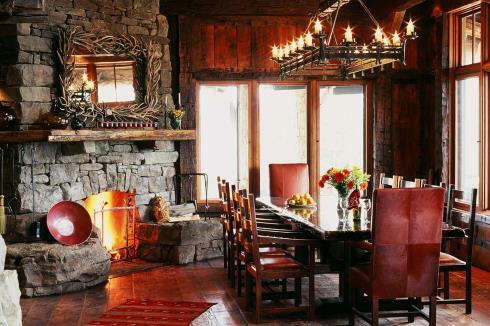 Standout Rustic Stone Fireplaces . . . Rugged & Revered! standing design firms in western America. Pearson Design Group, based in Bozeman, Montana, turns dreams into reality!
. . . the stunning home designs from this highly creative firm are nothing short of extraordinary! ors, as pictured at right and below . .
. . . . . as well as the exterior (below, second row). Note the exquisite hand-crafted detailing at the corners of this beautiful log home design. Rugged and rustic natural stone fireplaces are another hallmark of Pearson Design Group. The two designs pictured below are crafted from large blocks of cut stone that is roughly square and roughly rectangular in shape. Also note the large stone mantel shelves that have been worked into each of the designs. 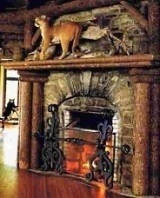 Similarly, the stone hearth design in the living room pictured at right is crafted from large blocks of stone and sports a stone mantel shelf. The rustic stone fireplaces pictured below are corner designs for bedrooms. While the design on the left -- with huge stone blocks for its hearth -- is positioned at a forty five degree angle across the corner and simply dives into the wall on each side . . . . . . . the stone work in the more elaborate design on the right angles backward just to the left of the firebox opening, giving it additional mass, as well as a more commanding presence. The rugged stone fireplace in the bedroom pictured below features a raised stone hearth with a built-in recess for storing firewood. It also incorporates a rustic timber mantel shelf resting on stone corbels, or brackets. Similarly, the rugged stone outdoor fireplace that follows boasts a raised hearth with a wide niche beneath it to hold plenty of firewood. What better way to enjoy the spectacular view and crisp outdoor air of this pristine mountain setting than cozying up to a large stone hearth with a warm and toasty fire? ation for years to come! quently add new images of rustic stone hearths to our site. Rock On with a Rustic Stone Fireplace!